Yoshiharu Sagara suddenly awakens to find himself smack dab in the middle of a battlefield in ancient Japan. But when he encounters the warlord Oda Nobuna, he soon learns the famous warriors of the era have been replaced by fierce females! A run-in with Nobuna’s younger brother, Nobukatsu, forces Yoshiharu to take on his toughest challenge yet as he must either gather 8,000 koku of rice in a week or lose his head. Yoshitatsu, the son of Nobuna’s ally, Dossan, raises a rebellion to protest his father’s alliance with the Oda clan. 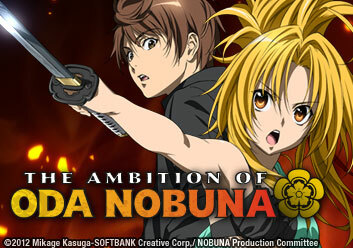 Nobuna must decide whether to send reinforcements and risk invasion by the Imagawa, or to let Dossan and his army fall. After the Imagawa invade, Yoshiharu is fired for ignoring Nobuna’s orders. Now, in order to regain Nobuna’s trust, Yoshiharu sets out to find the enemy camp and report its location to Nobuna and her troops. With one battle over, the Oda army must now prepare to take on Yoshitatsu’s forces. But when Yoshitatsu’s genius tactician, Takenaka Hanbei, thwarts their every attack, Nobuna and her comrades must find a way to sway Hanbei over to their side. Yoshitatsu’s strategist Hanbei has now switched alliances and joined the Oda clan. With Hanbei’s help, the Oda army hatches a plot to build a castle in a single night and reclaim the land that Yoshitatsu has conquered. The capital of Kyoto is unexpectedly attacked by the Miyoshi Three, thwarting Nobuna’s attempt to take the capital for herself. Now Yoshiharu realizes that the history as he knows it is much different from the events now unfolding before him. Yoshiharu and Nobuna head to the free trade city of Sakai to request funding from Imai Soukyuu and his fellow merchants. When the merchants strike a hard bargain, Yoshiharu and Mitsuhide find themselves facing off in a cooking competition. As the Miyoshi Three plot from the shadows, Yoshiharu and Nobuna’s relationship becomes strained when they learn that two of the Oda’s enemies have formed an alliance. But when an assassin appears, both of their lives are soon in danger. When Nobuna faces betrayal at the hand of one of her allies, she must decide whether to continue fighting a losing battle or to surrender. With no options left, Yoshiharu hatches a daring plan in an effort to protect Nobuna. With Nobuna incapacitated and Yoshiharu appearing to be dead, the Oda army faces its darkest hour. Nobuna’s vassals resort to desperate measures to restore their leader to power, and a vengeful Nobuna marches against her enemies. Oda Nobuna and her army march on Mount Hiei in preparation for their final battle. But when Nobuna’s thirst for revenge draws her into a trap, it will be up to Yoshiharu to save her and remind her of what kind of ruler she set out to be!